The best way to minimize disease is to provide personal attention and gentle care in an environment where cats are happy and not stressed. We do not allow cats from separate households to mingle in order to reduce any chance of injury or the spread of illness. We only accept cats that have their upper respiratory vaccines (FVRCP) up-to-date at least ten days prior to check-in. Adult cats, even those who are kept strictly indoors, should be vaccinated one year after their last kitten vaccination and then every three years thereafter. By prior arrangement, cats for whom vaccination would be detrimental may be boarded with a note from their veterinarian excusing the vaccine. Rabies and feline leukemia vaccinations are not required because these viruses are not air-borne. We regret that we are unable to board cats previously diagnosed with feline herpes virus. Our specialized ventilation system ensures that the air is always fresh and odor-free and, since each room is equipped with a negative pressure air exchange system venting directly to the outside, the risk of the spread of respiratory viruses is low. Even so, any cat showing signs of an active upper respiratory infection will not be admitted into the boarding area. We thoroughly disinfect all litter boxes, litter scoops and rooms with a pet-friendly cleaner to maintain the highest level of hygiene possible. Our sterilizing dishwasher ensures that food and water bowls are thoroughly clean every day. Please note that every cat, even strictly indoor cats, must have a veterinarian-approved flea preventive on board during their stay here. This can be Revolution (ideally), Program or Comfortis. Advantage is acceptable but, for efficacy, Revolution is strongly recommended. If your cat has any tendency to occasionally urinate outside of the litter box please discuss this with us before boarding. All cats must arrive in a carrier or on a leash. All cats six months of age or older must be spayed or neutered. For the safety of our staff we are not able to accommodate raw diets. Please see this PDF document for more details. Proof from your veterinarian that your cat is current with his/her FVRCP vaccines. Your cat’s food and detailed written feeding instructions unless already detailed on the online reservation form. Medications and special dietary supplements or treats, if any. An itinerary with email addresses and/or telephone numbers where you can be reached while you are away and/or a local contact who is authorized to make decisions on your behalf if you are unavailable. Whatever you think your cat would like to have with him/her during their stay: toys, brushes, blankets, scratching posts etc. are all welcome. 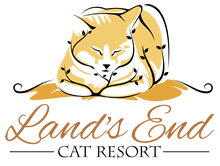 We provide plush beds, dishes, scratching posts and litter and litter boxes. Cash and cheques are appreciated in order to minimize transaction fees but we accept all major credit cards and e-transfer. We are not able to process debit transactions at this time.